This was my first time visiting Italy, and I cannot say enough good things about the fabulous experience I had. The rich history behind the Paestum temples and ancient ruins; lunch and shopping in picturesque Amalfi; cooking with the Baronessa, an outdoor picnic in the countryside, and sooooooo much more . . . . each day was a uniquely lovely adventure filled with amazingly delicious local food, camaraderie with fellow travelers, and memories never to be forgotten. Feast on History organized a perfect vacation that far exceeded my expectations, and I look forward to treating myself to another future vacation organized by them. It was magnifico!!! Imagine great friends going to visit family in Italy…and they invite you along! We got to experience the intimate lives of rural Italians in the most stress-free environment imaginable. At the end of every single day we thought, “Wow, that was the best day ever!” But then there was another day! The tours were wonderful; wrapped up in gorgeous scenery, beautiful vistas, history, wine, food and great company! If you enjoy getting off the beaten path and being shown the intimate details of a unique region then this is the tour for you. No way we would have found even half the experiences that Feast on History brought us to in Cilento. Every day was special, personalized, and memorable. Danielle and Christian share their extensive knowledge of food, wine, art, history and culture - along with their family heritage - giving us insights as if we were being hosted by locals. Come to think of it, that’s exactly what they arranged. Every day, people greeted us not as foreign tourists but as friends of their friends. I can’t say enough to fully convey how wonderful the week in Cilento was. Danielle’s tour of Arthur Avenue in the Bronx is pretty wonderful, too! As someone who doesn't like to go on "small group travel" this is a trip that redefines that term and will blow even the most seasoned traveler away! The way that Danielle and Christian set up these trips is more like going on vacation with friends you have known for years, that just happen to be experts at food, art, and wine in Southern Italy. They make you feel completely welcome and comfortable with being miles away from home. They are both very knowledgable about the region, Borgo La Pietraia where you stay is beyond fantastic and the family that runs it makes you feel like an extension of their own. The food - oh man, the food...the best food I have ever had and it was consistently good - there was no bad food day!! Basically - I cant recommend these trips enough! You should go - if you are thinking about it, just book it! You will be so happy you did! My husband and I found our Italian haven at Borgo la Pietraia in the mountains overlooking the Tyrrhenian Sea . It was our first trip abroad, and the guidance and comfort we experienced in being part of a “tour family” was just what we needed. Danielle and Christian did all the planning that went into our adventures and served as wonderful translators throughout our trip. Staying in one place and traveling out from that home base each day was so much easier than having to live out of a suitcase and change hotels nightly. The Borgo staff showed such warmth and kindness, as if we were part of their family. The facilities were quite clean and comfortable, and the food served was excellent! It was nice to experience life as Italians for a week. Feast on History is the way to go! I really don't know how to express my love for Feast on History without sounding completely schmaltzy. I hadn't been on a "tour" vacation since my senior year of High School. They just weren't for me. But when I read the description of this trip, I knew it was something different. Danielle and Christian had carefully crafted a week of experiences that gave me exactly what I wanted (and needed) in a vacation. We got to be tourists without feeling like tourists because were traveling with people who knew the area so well and never made us feel rushed or pressured. The balance was superb - the perfect blend of educational and experiential activities with just the right amount of relaxing down-time, all in one of the most beautiful locales I have ever been to. Prepare to be wined and dined to your stomach's content! Danielle and Christian provided me with an authentic tour in Irpinia and on the Cilento coast. The highlights for me were lunch at Nonna Pina Country House and Paestum's archeological park. Simply put, Nonna Pina's food was out of this world. (Come on, blended cacciocavallo and ricotta stuffed ravioli topped with black truffles!) Setting foot on the ground of an ancient Greek colony gave me a euphoric feeling. I highly recommend going on this trip and look forward to going on their tour again. My journey to Campania was everything I hoped for and more. Castellabate's charming streets and awe inspiring views...the glorious art and history of Paestum...the delicious local charm of cooking with the baronessa Cecilia...and the creature comforts of Borgo la Pietraia and their lovely staff. I'd say it was a 'once in a lifetime' experience, but all I can think about is returning to Italy with Feast on History! Normally, I like to travel on my own and never consider tours. The Cilento tour attracted me, though, because I had some business to conduct in a nearby village and Danielle and Christian were able to help me with that. So glad I went! Great people, fabulous food and wine, and gorgeous accommodations. I'd recommend her tour to anyone who wants to get a feel for the Cilento. One caveat: you might not want to come back! — Lisa Battalia, Washington D.C.
What a fantastic tour. I’ll never forget our time in the private garden of the Castle in Ischia. What a treat that your connections led us to that wonderful, quite private world. The wonderful people Danielle found to lead us through Naples and Ferrante’s world were informed, passionate, lovely people all. I’ve traveled to Italy several times before, but never felt quite as immersed in the real lives of Italians. Every Ferrante lover should go! Feast on History is the way to experience Cilento! The idea of "group tour" does not typically appeal to me; however, this was no "group tour". Instead it felt like a private tour with a relaxed, knowledgable, take charge, local friend. The food and setting (none of which I would have discovered on my own) were absolutely spectacular and Danielle and Christian's expertise cannot be beat. You will not regret this trip! As a medievalist by profession (and inveterate sightseer and museum-goer), I so appreciated the opportunity on this trip to visit monuments of art and architecture in southern Italy. If you chose to relax over a cappuccino in the town square on your “alone” time, you could happily do that – or you could take off, as I did, through the back streets of Ravello and discover the gardens and cloister of the Villa Cimbrone and the breathtaking views of the Amalfi Coast from the Villa’s Terrace of Infinity. Or climb the stairs of the celebrated approach to the Cathedral at Amalfi and view the Spanish Baroque art within – to see it was wonderful, but to share it with Danielle, herself an art historian, was a joy. 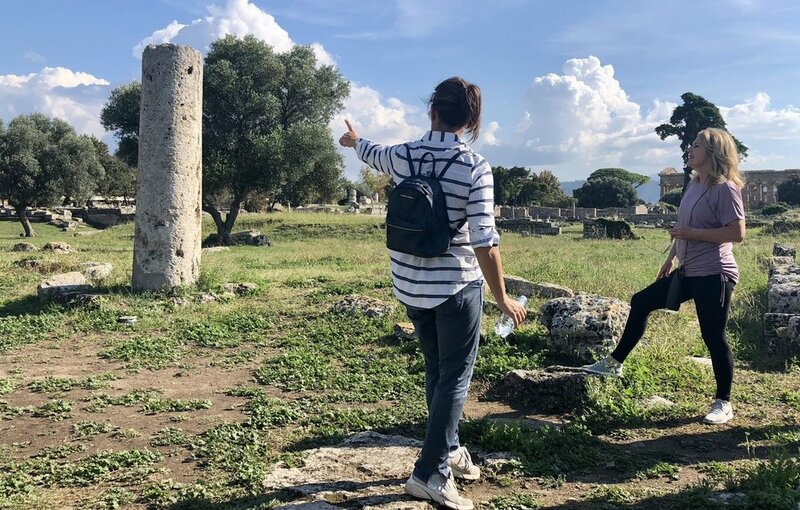 Or explore the ancient complex at Paestum – to see “in the flesh” the famous Temple of Poseidon, a photograph of which appears in every art history textbook. And then to return to our splendid accommodation at the Borgo and share a meal – local specialties chosen by Danielle and wines selected by Christian – with congenial company was such a pleasure – and a culinary adventure at times. "Danielle and Christian are the perfect tour guides for southern Italy. I never would have discovered the places they took us on my own. Their expertise on art, food, and wine made all the excursions extra special. Meeting their southern Italian family was a delight! I anxiously await my next adventure with Feast on History!" 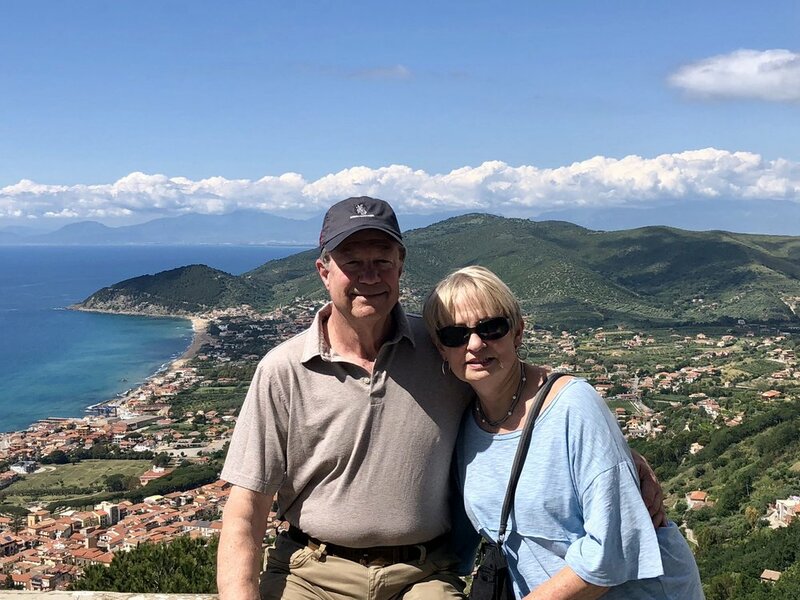 Watch a video testimonial by actor and writer Tulis McCall about her small group tour experience with Feast on History directly from Borgo La Pietraia. "I was lucky enough to go on the inaugural trip with Danielle and Christian. It was one of the best travel experiences that I have had. I am usually not big on traveling in groups, but this was different. The schedule provided a right mix of alone and group time, allowed each of us to explore at our own pace while providing opportunities for bonding and forming long-lasting friendship. Making things more amazing is that all of that happened within a very eclectic group whose members were from different cities and whose ages ranged from early 30s to early 80s. Aside from the great group dynamics, Danielle and Christian picked spectacular places to eat and drink great wine, while learning about what we were eating and drinking. We even had a chance to try our own hand at making a meal. The cultural part of the trip is also not to be underestimated. The great thing about Feast on History is that they introduce you to things you are just unlikely to find on your own -- small Italian towns virtually unknown to non-Italians, churches and museums unexplored by foreign tourists, and family owned restaurants cooking according to the traditional recipes. On this trip you get to see a much more authentic Italy than you do in the major tourist attractions. I cannot recommend this adventure highly enough and myself cannot wait to go again!" "Our Ferrante Fever tour was fantastic! Danielle was an amazing guide…felt like traveling with a friend. Danielle provided additional guides that were so informative not only about Naples and Ischia, but well versed in the Ferrante novels. Danielle related the sites and the books seamlessly. Our day on the island of Ischia I will never forget! If you are a Ferrante lover this trip is for you!" "Imagine getting off the beaten track from the famous cities of Italy and exploring the mountains and valleys along the Tyrrhenian Sea! This was our experience as we joined the maiden tour of Campania with Danielle and Christian. We woke each morning to view the expansive valley below our patio at the Borgo in the mountains, with the sea sculpted into the land in the distance. With our small group of twelve, we had private tours of historic sites and cooked at an elegant farm, were treated like family by the owners of our hotel and made lasting friendships. In their relaxed way, Danielle and Christian shared their expertise about archaeology, food and wine and made us all feel extremely comfortable!" I joined the inaugural Feast on History trip in October of 2015. I think I was one of the last guests to sign up about three weeks before the trip. Although it was a spontaneous decision (who can say "no" to Italy? ), it turned out to be one of the best travel choices I have made. I was nervous about traveling with a group since I typically like to travel alone and do my own thing, but this program proved to be different. Danielle and Christian have created an environment that is welcoming to all ages and interests, and a schedule that allows for enjoyment of group activities as well as alone time. They are truly passionate about sharing Italian culture and history with their guests. I really appreciated that I didn't have to think about a thing once I arrived. They took care of every detail, which allowed me to simply enjoy the experience. And they weren't kidding around when they titled the program "feast" because you will not go hungry! The food was absolutely amazing and opened my eyes to true local Italian cuisine, which I never would have experienced on my own. Danielle and Christian, as well as the Borgo folks, were gracious and warm hosts. I whole-heartedly recommend the Feast on History trips and hope to join another adventure with them in the near future!